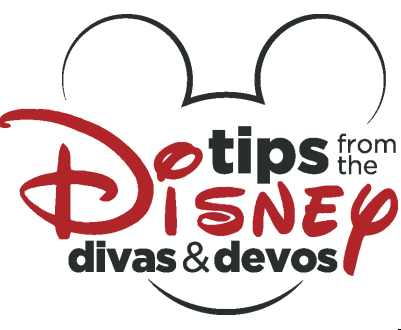 We all know you go on a cruise for the food, and boy does Disney Cruise Line deliver! 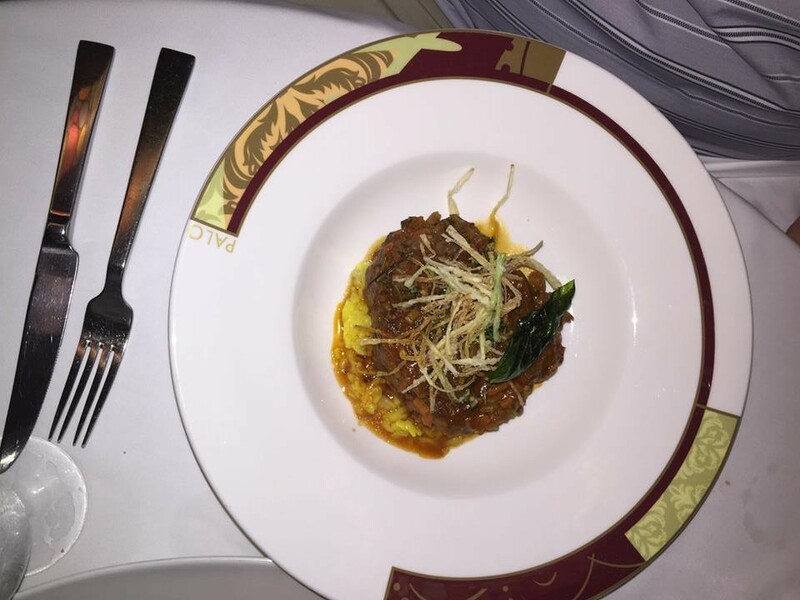 Palo is a signature dining restaurant that is available on all four ships of the Disney Cruise Line Fleet; Magic, Wonder, Dream and Fantasy. Palo is an extra cost of $25 per person, but totally worth it in my opinion. It is an adult only dining option, so those with little ones, make sure to make reservations at the Nursery or put the kids in the Club. 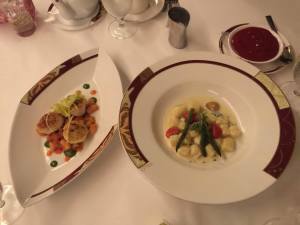 On the two newer ships, they also have another signature dining restaurant called Remy. It is $75 per person and is one that I have yet to try. One day, though, it will be done, but I have heard it is wonderful! 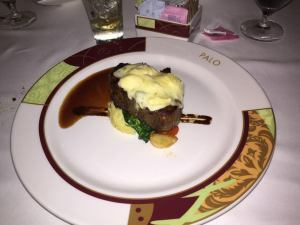 Palo is a must do for me and my husband on each cruise and it is open for brunch and dinner and the cost is the same for both. These restaurants book quickly so when your booking window opens, make sure to grab those reservations as quick as possible. Our Palo experience this past cruise was wonderful. We went to brunch the day before and had the best waiter, Mirko. We enjoyed him so much that he assigned himself as our waiter for the next night! There is a dress code for Palo; dress pants and a shirt or jacket is required for men and a pantsuit or dress is required for women. No jeans, shorts, Capri pants, flip-flops or tennis shoes are allowed. You will be sent to change if any of these dress codes are broken. Upon entering Palo, you can tell the atmosphere is very romantic. There are floor-to-ceiling windows throughout the entire restaurant (you get an ocean view from every seat!). An open kitchen is also among the views where you can watch your chef in action! It is located Aft (back of the ship) on all four ships and the views are amazing. 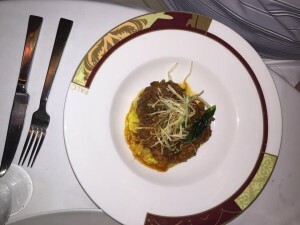 The cuisine is Northern Italian and it is delicious! 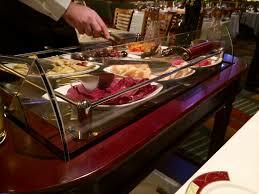 Once you are seated and your drink order is taken, your server brings over “the cart”. The cart is full of Antipasti; all of which is delicious! I’m not sure what most of it is except for Prosciutto (what bacon wishes it was), beef Prosciutto, aged Mozzarella cheese drizzled with balsamic and bread. That combination was amazing!! There were several other things on the plate that Mirko gave us, but I honestly do not know what most of it was except for the green olives. The appetizers that we ordered were Grilled Sea Scallops with Borlotti Beans and Pancetta served with a Tomato Sauce and Gnocchi di patate con Gorgonzola e Asparagi, Potato Gnocchi served with Gorgonzola Sauce with Asparagus. The scallops were delicious, but the Gnocchi was not my favorite. I can’t love everything!! Instead of a salad, I ordered the Wild Mushroom Risotto (forgot picture), but it was wonderful. Very creamy and very delicious. For our main course, three of us ordered the Our Beef Tenderloin “Palo” topped with melted Gorgonzola cheese or Palo signature Barolo Red Wine Sauce (I obviously had to try both) and my husband ordered the Osso Buco which is a slow-roasted centre cut Veal Shank with Gremolata and Risotto Milanese. 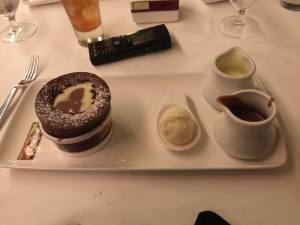 Both were fantastic and highly recommended for anyone who tries the restaurant. I did have to send my steak back twice for being overcooked, but they quickly remedied it and were able to get me a perfectly cooked medium Beef Tenderloin, which I thoroughly enjoyed. For dessert, we each had the Chocolate Soufflé. I honestly go to Palo for this very reason. This is by far, the best dessert and one of the things I look forward to the most. 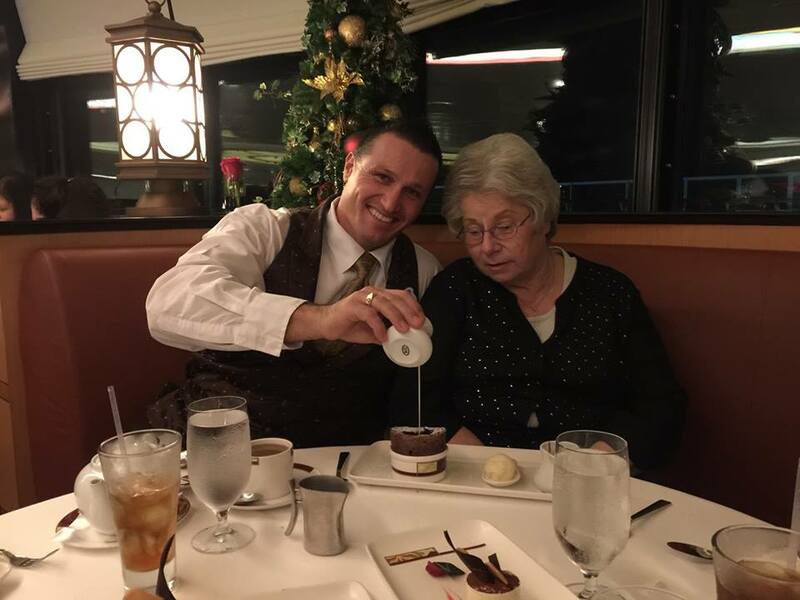 The soufflé comes out piping hot and as Mirko demonstrates above, he creates a hole in the soufflé to pour the vanilla and milk chocolate sauce. It is out of this world amazing!! 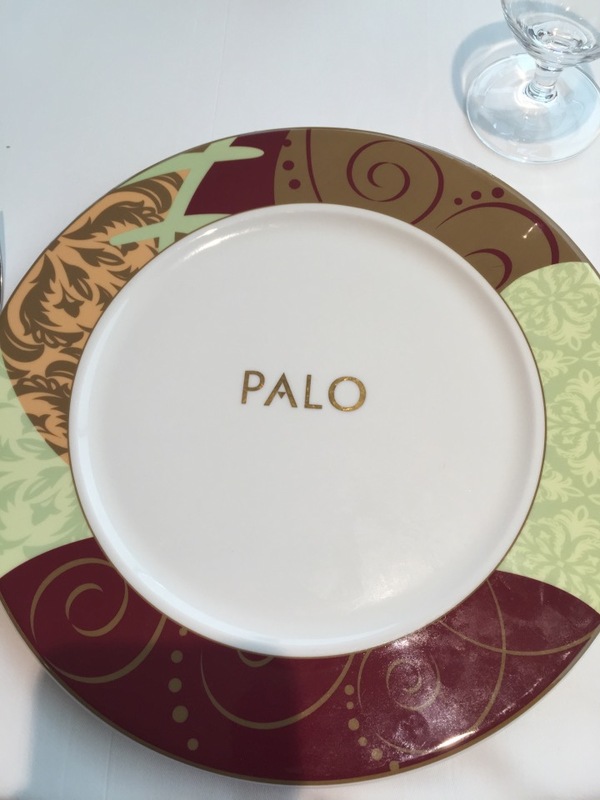 So when you are ready to book your cruise, make sure to make a reservation at Palo! It is a must do and a could be that special date night for you and your significant other. We aren’t kid-less very often, but when we are, we try to make it count. 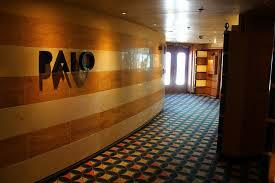 Looking forward to my husband’s and my 10 year anniversary cruise and Palo will be on our to-do list. We may even splurge and try Remy. It will be a special occasion. January 2016 on the Fantasy, here we come! !